This design is free from the Universal Yarns website. 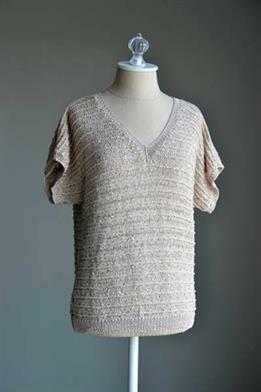 : This fun and basic v-neck tee uses two yarns: Nazli Gelin Garden 5 - a soft mercerized cotton, with Cotton Gold - a glittery cotton yarn with sequins, to create a unique and textured, yet classic garment! This design is free from the Universal Yarns website. Remember to download or print the pattern by following the link provided on this page, as it will not be shipped with the yarn. Size US 2 & 4 straight needles ( or sizes needed to obtain gauge), a tapestry needle, and a safety pin are required but not included. Finished Bust Size: 34 (38, 42, 46, 50, 54)" after blocking. This piece is intended to be worn with 2-3 inches of positive ease. Gauge: 28 sts x 36 rows over 4". Colors shown: Garden 5 - #500-69, Cotton Gold - #1091.